Cyclamen mirabile photos : Cyclamen mirabile "Tilebarn Nicholas"
You can visit our Cyclamen mirabile page or browse the pictures using the next and previous links. If you've been inspired take a look at the Cyclamen plants in our garden centre. Yes, Tilebarn Anne is quite a stunner too. Oh, .... my ...... God! How is it propagaged, Gal. Seed and then selecting the best coloured leaves I think. I'm sure I've read somewhere that you can slice cyclamen tubers up to give cuttings but I've never tried. I've had a lot of Tilebarn Nicholas seedlings come up this year from seed I collected last year, however none of them show this sort of colouring. I suspect (hope anyway) that I've got to wait until they mature a bit before I see anything like the picture. I always thought that you could not dice and slice Cyclamen. But if it has a cultivar name, it must be capable of some form of vegetative propagation. I can't think what it would be?? 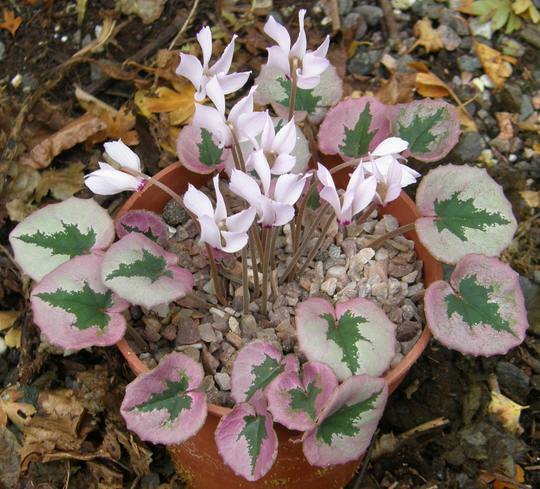 See who else is growing Cyclamen mirabile "Tilebarn Nicholas".